Change is what makes the world go around, especially for cupcake aficionados who just can’t get enough of these ever evolving treats. Their new and creative shapes, tastes and sizes make them some of the best things that happened to sweets and their fans couldn’t agree more. Many of us can’t imagine our day without a little cupcake and for good reason. Read on for a taste of the cupcake revolution. The lineup of the world’s most famous sweets is not complete without cupcakes. Everyone with a sweet tooth will attest to this but what’s great about these treats is the fact that they continue to evolve into different tastes, shapes, sizes and even recipes. Over time, makers of these sweets have become more innovative than ever, much to the delight of every cupcake enthusiast. Cupcakes are baked just like the big cakes but are more versatile because of their small size which makes variety possible. The designs they come in are now more intricate and sophisticated than before. They can have ribbons or jewels on them and make any event come alive, including weddings, anniversaries and kid parties where the mini cakes may be decorated with different cartoon characters. Black and orange cupcakes are very common during Halloween while red and green ones with Santas and snowflakes abound during Christmas. For baptisms, booty and mitten designs are very popular while for Valentine’s day, flaming red heart-shaped cupcakes seem to say it all. The sweets can also be personalized with names and packed individually. Their shapes have become more exciting, with some taking the shape of burgers, cars, robots, hearts, rose petals, ice cream and animals. Cupcake recipes have become more adventurous as well. Beyond the usual chocolate, vanilla, strawberry, and mocha flavors, the list has expanded to include peanut butter, pistachio, coconut, mint chocolate, peppermint, lemon, orange, watermelon, carrot, pumpkin, raspberry, banana and many others. Cupcake enthusiasts are ecstatic about the entry of more unconventional flavors into the market such as potato chips, tomatoes, candied bacon, jalapeno and sweet corn. The frosting or icing can be a whole attraction by itself as it now comes in variants such as butter cream, cream cheese and fondant. Butter cream has a sweet, buttery taste, cream cheese is sweet and tangy while fondant leaves a chewy, sugary taste on the tongue. For cupcake lovers, the frosting plays a big role in how much enjoyment they get from these treats. In fact, each type of frosting has its own market just as each cupcake has its own followers. Cupcake lovers tend to have their own personal favorites, which is one of the reasons that this business has grown immensely through the years. These cute little cakes have also become a choice for gifts and giveaways during special occasions because they can be uniquely designed, easily customized, and packaged per piece or in sets. 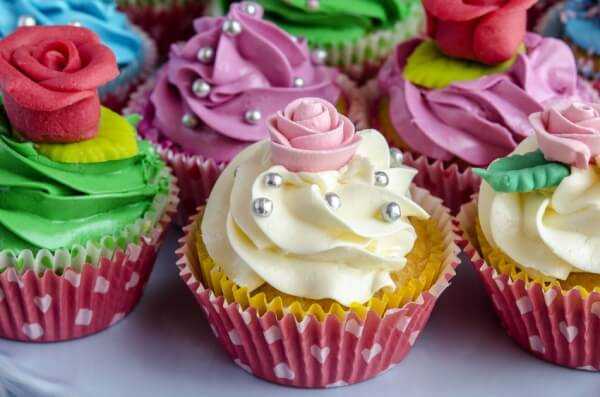 Due to people’s seemingly unceasing fascination for these sweets, groups of friends, neighbors and family members would mark a certain day of the week as a day of cupcakes. They have a small party where they can show off their unique cupcake creations and discuss more design and flavor possibilities for future meetings. Out of this fascination, “Cupcake Fridays” or “Cupcake Sundays” have become regular events. Indeed, the world of cupcakes is only limited by the imagination of those who make them and those who eat them can only crave for more. When making cupcakes, you will never get bored. Plus, cupcakes are so versatile that you can serve them on any occasion – be it a birthday or a wedding. Are you a cupcake junkie? Can you get through the day without a little, cute iced pick-me-up?